Gatsby has been obsessed with pizza since he counter-surfed his first piece of pepperoni. 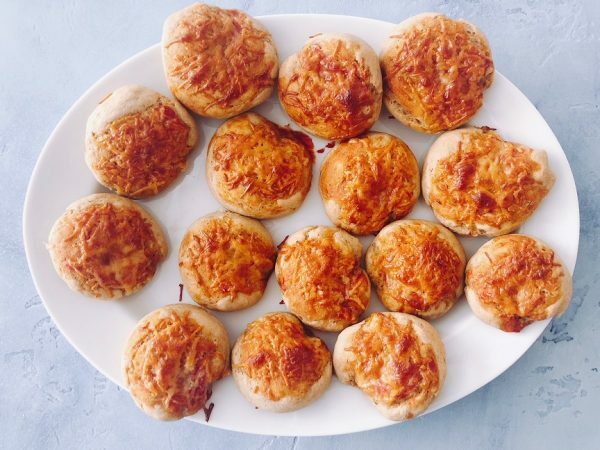 As this is not the healthiest fare for him, I love to bake him these puppy friendly pizza bites for an occasional treat. They look and smell so much like the real thing that you might even be tempted to take a bite! In a large bowl, mix the yeast, warm broth and honey. Allow the mixture to sit until the yeast bubbles, about 5 minutes. Add the flours and knead the dough until smooth and elastic, 5-6 minutes. Note steps 1 and 2 can be done in a mix-master. Place in a lightly oiled bowl (I like to use coconut oil) and allow to proof in a warm place until the dough has doubled in size, 45 minutes to an hour. 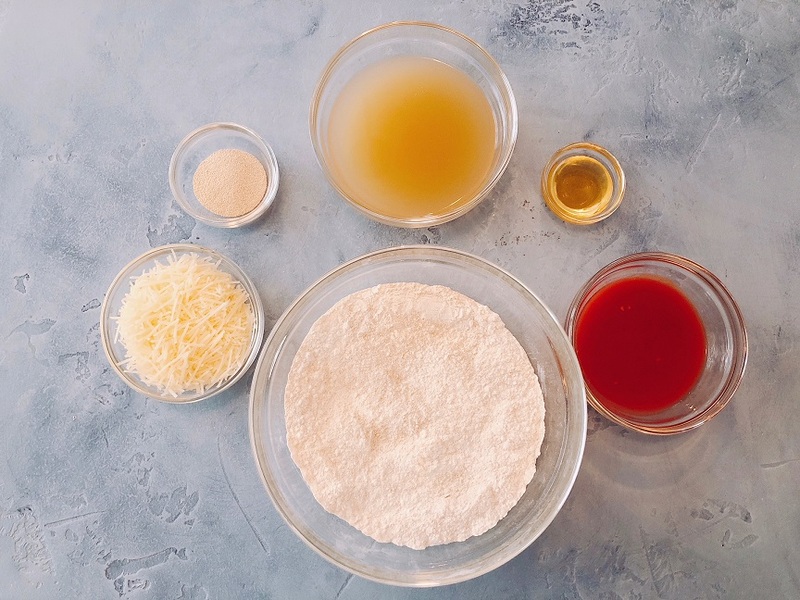 Remove the dough from the bowl and divide into 20 bite-size balls. Form the balls into bagel shapes and place on a parchment lined-sheet. You may need to use two sheets as you want the balls to be placed at least an inch apart. Cover the bagels with a kitchen towel and allow to proof an additional 30 minutes, until doubled in size. Top the bagels with tomatoes and cheese. Bake until golden brown and crispy, about 30 minutes. Serve one as an occasional treat for your dog. Store in an airtight container for up to a week.